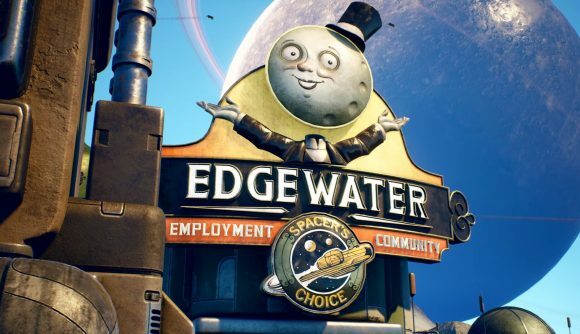 The Outer Worlds was announced last night at The Game Awards, and its developers weren’t shying away from its ties to the Fallout series. Not only are Obsidian responsible for the best modern Fallout game in Fallout: New Vegas (don’t @ me), the company was formed by former employees from Black Isle Studios, the team who created the franchise’s first iterations. Since The Outer Worlds was revealed last night, one of Obsidian’s founders, Chris Avellone, has piped up to offer his take on the timing of the game’s announcement. Avellone, who left Obsidian in 2015 having worked as a senior designer on New Vegas, posting a tweet poking fun at the current franchise owners, Bethesda. The tweet, which you can see below, takes a screen cap from The Outer World’s new Twitter account. That relatively wholesome tweet simply reads “Hello, world!” and features two stills from the game’s trailer, which debuted last night. Avellone, however, has twisted that message slightly, editing in a his own dramatically less wholesome ‘translation’ of Obsidian’s message. Jokes are famously made better when they’re explained to you, but on this occasion I think I’ll just let you read Avellone’s tweet for yourself. It’s no great secret that Bethesda has had a pretty crappy end to 2018 – Fallout 76 has received a pretty mediocre set of reviews, and fans are upset that they still have years to wait before the next major entry in the series. That’s been compounded with a series of PR disasters, and now another studio has come out with something that looks a lot like a spiritual successor to its original games.